Started this discussion. Last reply by Nick Knite Oct 13, 2012. Started this discussion. Last reply by Nick Knite May 21, 2009. Welcome and may the funk be with you! how to build a CACTUS NINJA. it’s been quite a while, but finally i can bring you a fresh new batch of cute little MBunnies. 6 fresh ideas and new approaches to designing the little hare. it still amazes me, how many ways there are to make each custom unique! Marshall, MCK and 3eyedbear along with their girls came over to germany to join me at the kunstsommer arnsberg, an annual arts, crafts and music fest in the summertime. 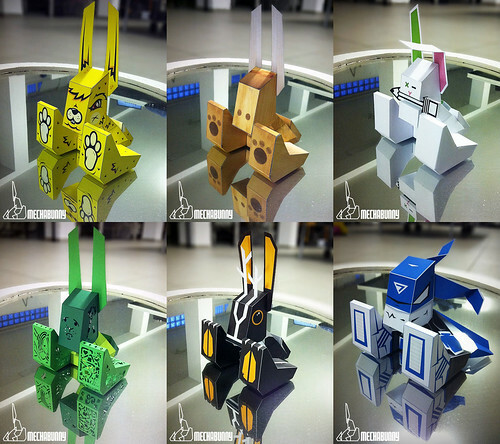 I have recently created a blog dedicated to my papercraft design F.A.T.S. I am trying to get blank templates from great papercraft artists like yourself to convert them to "machines" for the F.A.T.S universe. I really love your MechaBunny design and would like to customise it for my F.A.T.S universe. I hope you can send me a blank template . hahaha. i hope i get rid these stupid exam i'm gotten into as fast as i could. oh what a shock, well i'm imagine build your cactus toys and put it with my radiation cactus eater near my notebook. that could be AWESOMEEE! and i love what you do to paper world. you ROCK!